I don’t typically make pretty cookies. Well, that’s not entirely true. My cookies are pretty in that they are well made, and look delicious (and are delicious). But I don’t do character cookies, the really cute ones that look almost too good to eat. Generally, these are the cookies I leave to the professionals, mostly because I’m afraid of screwing them up. But this holiday season, I am embracing the challenge to make a really cute and delicious batch of cookies. 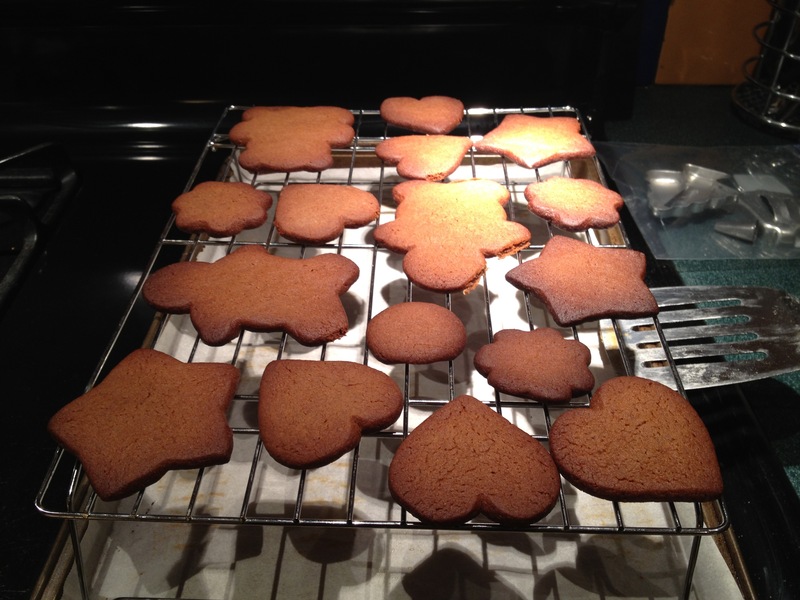 And since my Thanksgiving ginger cookies were a huge success, I thought I’d give gingerbread men a try. I looked through several recipes from a number of well known chefs and bakers: Anne Burrell, Paula Deen, and Nick Malgieri to name a few. I saw recipes that were heavy on molasses and some that require a mix of molasses, honey and brown sugar (I imagined that dough had the consistency of super glue. I saw recipes that called for four tablespoons of butter and others that called for two sticks (1 cup)–a huge difference. No one seems to agree on the measurements of the supporting spices (cinnamon, allspice, nutmeg and clove). And one recipe yielded sixteen cookies. All that work for sixteen cookies? Um, sorry, but no. I spent several hours looking for the perfect recipe—and to me that meant one that called for butter as its base fat, had a good balance of spices, yielded at least thirty cookies, would keep for a long time and wasn’t very intimidating. I only found what I needed when I revisited my cooking manual: Mark Bittman’s How to Cook Everything. On page 897, I found the recipe for Aunt Big’s Ginger Snaps, with a spiced variation that satisfied my craving for a flavorful and balanced cookie. The ingredient list and instructions were straightforward, and I knew the cookie would have good body and taste because it had a solid backbone: two sticks of butter, and one cup of molasses. Squee! 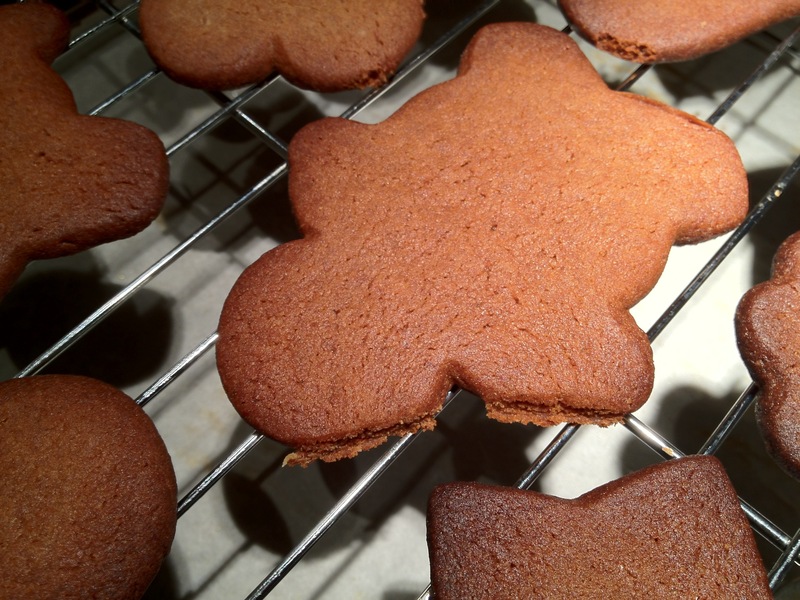 The one thing all the gingerbread cookie recipes had in common was that not one of them gave good directions about how to handle gingerbread dough. This made me a little anxious, especially since I was baking cut-out cookies for the first time, and because molasses, although it goes so well with with ginger, makes cookie dough really sticky and difficult to work with. I wrote to my friend Andrea, an experienced baker, who compared gingerbread dough to “construction material” when I first brought up the idea of making the cookies. Too late. The dough was mixed and in the freezer. There was no turning back. Besides, I had invested $8 on brand new and super cute cookie cutters (a little man, a bear and a star). I had to press on. The only thing to do was conduct some experiments. Work with a small piece of dough, see how long it needed to thaw, and figure out the right thickness for rolling and making the cut-outs. Attempt 1: I let the dough rest on the counter for 15 minutes. It was still hard, but I placed it between two sheets of parchment and threw my weight into rolling. I couldn’t see how thick or thin the dough was, and ultimately I got the dough warm enough that the parchment paper had stuck to it completely. Chilling in the freezer for another 30 minutes didn’t help much, so I had to scrape the dough off the paper with a sharp knife, shape it into a disc and chill again. Attempt 2: I stuck with the “between the sheets method”, but thoroughly floured the sheets before rolling. Then I chilled the dough in the freezer for 15 minutes before cutting. Peeling that top piece of parchment was a challenge, but I got it off and worked quickly with the cookie cutters. This time I had rolled the dough too thin (note to self and readers: Bittman’s assertion that you should roll the dough as thin as possible is WRONG). I made shapes, but they didn’t lift off the paper with the cutters, and I couldn’t peel them off the paper without disfiguring them. A mess! Attempt 3: At this point my reshaped dough disc had been chilling in the freezer for a half hour, and I made note to let a frozen piece thaw at least 30 – 40 minutes on the counter before rolling. This time, I got a single fresh piece of parchment, floured that, floured my hands, floured the rolling pin, and gently floured the dough. I rolled the dough to a 1/4″ thickness on the parchment (I didn’t cover it so I could see the thickness). This time, I was able to make shapes with the cutters that stuck within them and lifted easily off the parchment paper. Immediately I transferred the cut dough to the cookie sheet (also covered in parchment) before baking. After 3 attempts to shape these cookies, they finally make it to the cookie sheet. Into the oven the little buggers went. Bittman recommends 10 minutes, or until the edges are golden brown. Problem is, the dough is dark brown, so how the hell can you see the edges turn golden? You can’t. I checked the cookies after 10 minutes and make the mistake on pressing down on one of the cookies. Still too soft. I turned the cookie sheet and closed the oven door, checked again at 12 minutes (still too soft), again at 15 (almost there!) and removed at 17 total minutes of baking time. Seventeen minutes in the oven gave me construction material. The cookies smelled delicious, but were very dark brown, and in some spots black on their undersides. No chew at all, just a hard “snap!” with a determined bite. I suppose 17 minutes may be the right baking time for gingerbread house parts, but not for cookies. Next time, I will check the cookies at 10 minutes, and not let them go beyond 12 minutes. They will set as they cool in the pan, and moreso while they’re cooling on a wire rack. Also, as you may have been able to tell from the picture above, I put the cookies too close together. They need at least 1.5″ of breathing room on all sides, because gingerbread cookies, like Ballpark Franks, plump when you cook ’em. Out of the oven. That's a porky little bear. 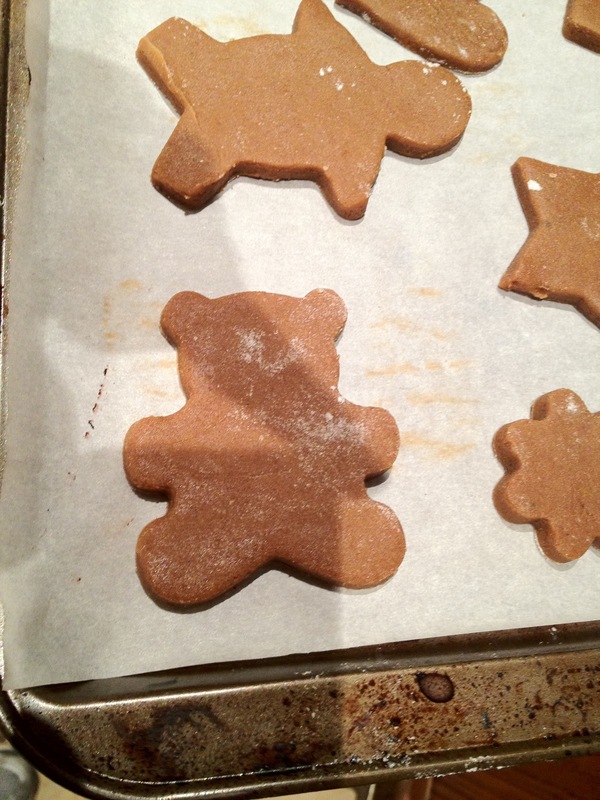 I had a pan of plump bears, men, stars and hearts, and one of the men ended up maimed after I tried to separate him from the heart he had fused himself to while baking. The final test: Taste. I’m happy to report that I succeeded here. Bittman’s recipe (the spiced variation) produces a cookie teeming with flavor and just the right amount of zing. At first bite I was hit with all the spice at once, and then chewing I could taste the cinnamon and nutmeg, and then I got the pop from the cloves. The ginger is very evident throughout, and leaves a gentle (and welcome) flavor on the tongue. The richness of the molasses was unmistakable, and the butter produced a great crumble, which would have been even better if I hadn’t overbaked the cookies. You really do have to throw your weight into rolling this dough (as Andrea had warned me). Luckily, I developed my upper body strength training with a boxer, so this part wasn’t too hard, though I should have stretched my arms and back before rolling. Seriously. A lot of recipes will tell you to cut the cookies, take the scraps of dough and reshape the dough into a disc only once more before re-rolling. I can report that reshaping and rolling several times, as I did for the purposes of my experiment, has no effect on the taste of the cookie, and really shouldn’t have any effect on the texture, provided you’re working with chilled dough. The most important thing I learned, and an idea that my friend Andrea reinforced, is that you have to be working on a solid, dry surface. I worked the dough on floured parchment, which was placed atop my cutting board. You can use flour, or powdered sugar, which Andrea suggested. You could also use your cutting board, “which is good if it’s wood, but marble is the Holy Grail of rolling boards,” Andrea said, because marble will keep the dough chilled. If you’re checking the cookies for done-ness, don’t press on them. As I found out with one of my bear cookies, the dough doesn’t bounce back, and it came out of the oven with a fingerprint on it. 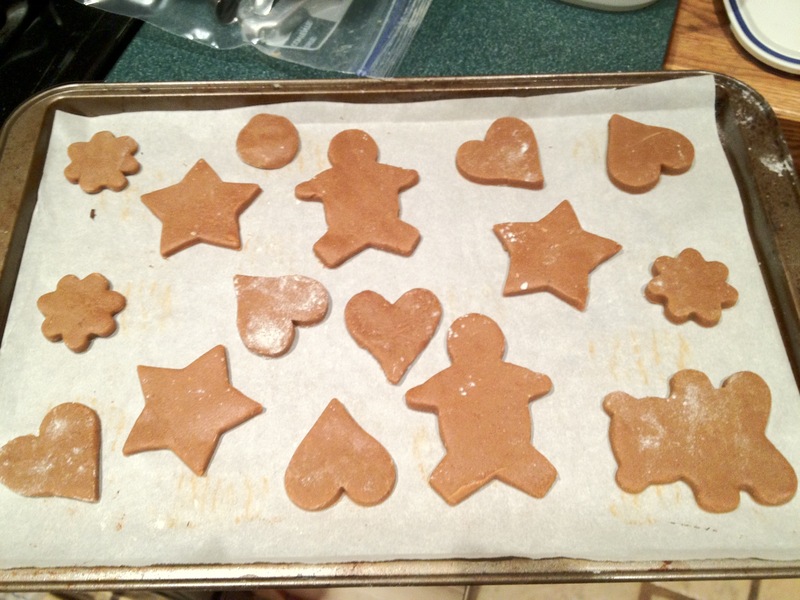 The whole process, while not a huge success, was far from a failure, and now having educated myself on what to do with this challenging dough, I have the confidence to roll, cut and bake the rest of the gingerbread cookies. As for decorating—well, that’s another story. I suppose that’ll take some practice, too. Recipe and photos of the finished products to come! 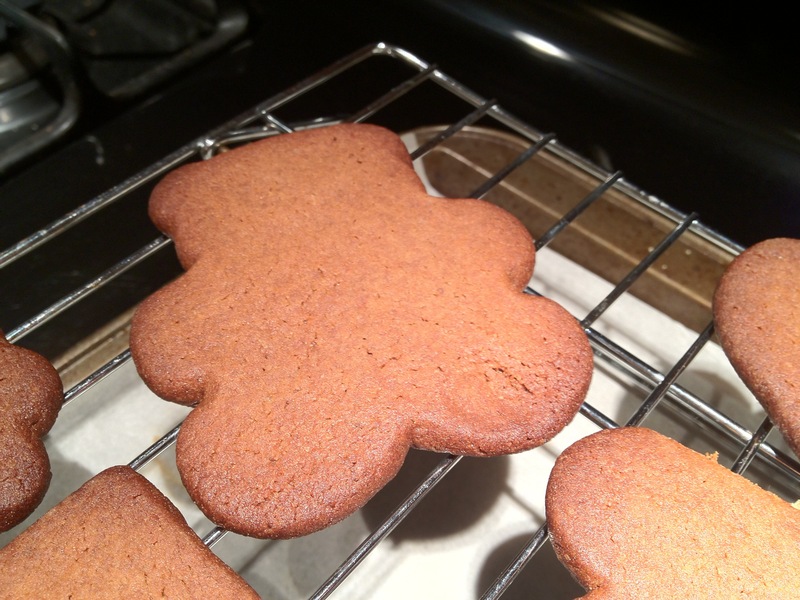 This entry was posted in Musings, Sweet Tooth and tagged baking, Bittman, Burrell, chilled dough, cookies, cut out, Deen, dough, ginger, gingerbread, handling, holiday, Malgieri, molasses, rolled cookies, spice, sweet. Bookmark the permalink. I love your scientific method and documentation – and exactly what I need to do in my own cooking. Keep up the good work!